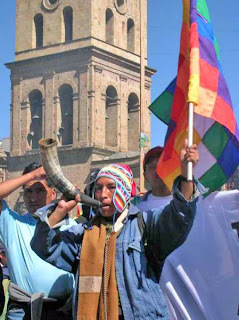 General elections were held in Bolivia on Sunday, December 6, 2009. A few weeks before these elections I had the opportunity to discuss the contours of Evo Morales' first term in office with the Bolivian Ambassador to Canada, Edgar Tórrez Mosqueira. The following interview provides a backdrop to the elections that were held yesterday, and highlights many key official government perspectives about the process of change currently underway in Bolivia. JRW: I'm here in my office at the University of Regina, on November 12, 2009, with Edgar Tórrez Mosquiera, Bolivian ambassador to Canada. I'm very pleased to have this opportunity to speak with you, an official representative of the Bolivian state, in the very important current conjuncture, immediately before the forthcoming December elections. I have a series of questions for you. First, to start off, can you describe your personal political formation and political trajectory? Your historical relationship with the Movimiento al Socialismo (Movement Toward Socialism, MAS) party? And how you eventually became the Bolivian ambassador to Canada? ETM: Thank you very much for the interview. My academic formation dates back to the 1970s. I began university in 1974, during the dictatorship of [Hugo] Banzer. The Banzer dictatorship lasted for seven years [1971-1978]. It was the longest dictatorship in the twentieth century [in Bolivia]. In this period I was a part of a Leftist formation, a frente amplio, or broad front, seeking to bring down the Banzer dictatorship. This was the initiation and beginning of my political career. During this entire process I was exiled twice, in 1975 and 1978. I had been in the department of sociology. In that time the department was characterized by its foquista orientation, people of the far Left.1 The struggle was to reopen the department of sociology, and we were up against the worst dictatorship that Bolivia had had in that epoch. I was introduced in this way to the new generation of the Left, inside what we call the national Left. With an objective of linking together all of the social movements behind one fundamental objective: the inclusion of the poorest sectors in Bolivia. So, this is where the concept of linking together the intellectuals and the social movements of Bolivia was born. The traditional parties were also present in that period, like the pro-Maoist, Communist Party-Marxist Leninist, the Communist Party of Bolivia, which came from what was the guerrilla group of Ernesto Che Guevara in 1966 and 1967. So there was this effervescence among the youth, with growing revolutionary consciousness and the idea that it was possible to fundamentally change the fascist model that was in place. Above all, I believe my political formation is based on a militant and programmatic commitment to the recovery of the interests of the great majority of my country. In that sense, this explains my ties, within the MAS, to a group of intellectuals who interpret and design the proposals generated for Evo Morales. Evo Morales represents the first indigenous president, not only of Latin America, but of the world. He is the most authentic representative of the most dispossessed sectors of Bolivia. I believe the platform of the MAS represents the necessary cooperation, dialogue, and consensus that will allow for progress. In the conjunctures of the 1960s and 1970s, extreme positions were defeated. Now we want to intellectualize, we are trying to develop a new language, in order for Bolivia to advance. We began a great ideological and political convergence between social movements, the middle classes, and intellectuals, to push for a major advance, and to take power. In the 2000s, because of the fact that for the first time in many years there was a massive effervescence of social movements, we could envision taking power. This began with the Water War of Cochabamba in 2000, and then Black October in 2003, and then we arrived at the elections of 2005 in which Evo Morales was elected with tremendous support, with 53.7 percent of the popular vote. What happened following this conjuncture? Evo Morales won the elections, but the Right, or the oligarchy, had entrenched itself in four [of the nine] departments [states or provinces]. In these four departments [Tarija, Santa Cruz, Beni, and Pando] the traditional right-wing parties took up the banner of trying to bring down the first indigenous president. And it is because of this [these right-wing forces] that in this period of three years there were four elections. Attempts to call into question the legitimacy of the presidency of Evo Morales. But, in the second election Morales was ratified with 68 percent.2 This is unparalleled in Bolivian history. Normally, in Bolivian history, Presidents have received between 14 and 22 percent of the popular vote, and none of them have achieved the magnitude of votes which Evo Morales received. What do these percentages -- the 53.7 percent and the 68 percent -- mean? It means that of the three million inhabitants who can vote 2.5 million are voting in favour of the project of the MAS which Morales has designed for the advance of the country. This is the great contribution, to be able to advance within this conjuncture in Bolivia, after more than 25 years of neoliberal governments. What is the premise of this [the MAS's] platform? The social inclusion of the large social sectors that were marginalized by previous governments. We have to strengthen and deepen the democratic conjuncture in which we find ourselves. In the elections of December 6, 2009 we will have been in office for three years. How have we run the country? With transparency, fundamentally, defeating corruption. Everyday we have to overcome corruption implacably. This is what will correct the political system in which we are situated. One of the greatest virtues of Evo Morales is his transparency. He is incorruptible. To have a program, a political platform, in which not only the indigenous sectors and social movements are included, but also all the sectors of the middle class, including sectors involved in industry. All of these sectors are committed and are fighting for the continuation of this process. We know that this is a very difficult conjuncture, but a new national consciousness has generated this new political project, such that this is not a moment about Evo Morales, but rather a moment for the country as a whole to be able to move forward. We understand that the external conditions are not the most favourable. The pact between the United States and Colombia, in a certain manner, is going to be an obstacle for this process of change. But we also know that the strength of the Bolivian people is fundamental to being able to advance. JRW: There has been a process of change throughout much of Latin America more or less since the end of the 1990s. This has expressed itself electorally via Hugo Chávez in Venezuela, Rafael Correa in Ecuador, and in many other countries as well. At the same time, it seems to me that there are contradictions and complexities at the heart of these various processes. In this context, I have a question regarding the specific case of Bolivia. On the one hand, Evo Morales speaks frequently in international forums from an anti-capitalist perspective. He denounces capitalism as a system based on the exploitation of people, and particularly the poor. And he also denounces capitalism as a system which destroys the ecological systems of the world. On the other hand, though, we have Vice-President Álvaro García Linera speaking within Bolivia about the impossibility of socialism in the current context in that country and promoting rather what he calls "Andean-Amazonian Capitalism." So, it seems to me that there is at least an apparent contradiction, discordance, between these messages. Can you explain this contradiction? ETM: In the current conjuncture, we have to look at what is happening in Latin America. In Latin America the correlation of forces is in favour of the social movements. Bolivia has a very special particularity. What we have to do first in the current conjuncture is to strengthen the inclusion of more than 4.5 million who have been marginalized, excluded from the management of the state. In this sense, what Vice President Álvaro García Linera is doing is interpreting the reality of the Bolivian context. The Bolivian state has an historic debt to these sectors that have never benefited from health, education, or basic services. Therefore, in this first phase, first and foremost, we are emphasizing the inclusion of these social sectors that have never benefited from the way the state has been run. We have to overcome the social exclusion, marginality, illiteracy, malnutrition, [high levels of] mortality. These are fundamental stages if we are going to be able advance. If in this first phase we do not fulfill this historic role we will be running against the mandate of the indigenous peoples and the social movements. Therefore, it's very premature to launch a call for twenty-first century socialism if we haven't fulfilled this first phase. No dichotomy exists between the President and the Vice-President. What is more, there exists a harmony of focus, on the social. The intelligentsia within the Movement Towards Socialism believes that it is fundamental to complete these primordial, fundamental stages -- as Foreign Minister David Choquehuanca says, to live well, not to live better. What does it mean to live well? We have to provide health and education to all those huge social sectors that have never had anything, to defeat illiteracy, malnutrition. These are things that you see every day in my country. This is something fundamental to understand. Now, in those international forums, Evo Morales has spoken out against savage capitalism. What does savage capitalism mean? It means a capitalism in which profits are not distributed to the social sectors that need them. We understand that investment is fundamental to move forward, but we don't want bosses with this investment, but rather partners. In the long history of Bolivia all of our natural resources have been pillaged, and none of the benefits stayed in our country. Our new proposal means that the big investors also have to share their wealth. This is the new model, the new focus that President Evo Morales is introducing. There are no divisions within the leadership. It's only that we all recognize that each stage, each phase has to be fulfilled. And from there, we continue to move forward. What is the differentiation between the Ecuadorian, Venezuelan processes, or the Cuban process in the 1960s [and what is happening in Bolivia]? The conjunctures are different, and so are the realities. There can be no homogeneity in revolutionary processes. Why? Because we have different kinds of interests, but our objectives are the same. But the roads for arriving at those objectives are different. And so we feel that we have first to complete certain historical commitments. We are saying that for the last 250 years . . . [inaudible] the state never fulfilled them for the marginalized social sectors. So we have to attend to these qualitative jumps in order to arrive at the final objective, before moving beyond. We have to continue to advance without skipping stages, but rather completing them. Because we believe that in order to advance there needs to be a great national convergence. These are social conquests that we can't forget, and which can't be defeated when they're only halfway across the road. From our perspective we have the methods that will enable us to arrive at our goals which we have put forward within the platform of the Movement Towards Socialism. JRW: It's essentially a sure thing that Evo Morales is going to win the elections in December, in part because the Right is massively divided at the moment. So, what will be the principal objectives of the next administration of Evo Morales, for the next five years? ETM: The new political construction of the state -- which was approved in a referendum by a majority, and therefore is not an imposition in any way. The people voted for this new political constitution of the state. Through this new constitution we are designing a new country. What do we want in these next five years? We have advanced, but we need to deepen. Part of this are the Millennium Development Goals. We have to eradicate, fundamentally, [the levels of] mortality. We have to provide education, health, basic services, water, lights, to those sectors who have never had them. Parallel to this we have to develop the industrialization of our natural resources, for example in the area of hydroelectricity. We have great resources, similar to Canada -- not to the same extent, but we have them -- which will enable us to initiate mega-projects, such as generating hydroelectricity. And we have natural gas. At the moment we export our gas to Argentina and Brazil in its raw form. We have to begin projects to separate the gas [into its different stages of production], which is going to generate new revenues. We have the lithium project, which is also going to be controlled by the national state. And, obviously, we are designing a new proposal so that there will be investment also. There are also numerous large projects of linking highways. This is what we have to offer the Bolivian people in these next five years -- it's consolidating the state; recovering our natural resources; industrializing and generating value added; creating jobs that mean that Bolivians will no longer have to migrate outside the country. These are fundamental projects for progress. Outside of this we have the theme of autonomies. This is a very tricky issue, autonomy . . . [inaudible]. What Bolivia aims to do is to have autonomous departments, autonomous localities, and autonomous indigenous communities -- so that there is integrity between the three. That they share fairly, in order to generate a relationship between the three levels, together with the executive. Autonomies are going to allow us to advance, and to design a new country. It is not possible, under the banner of autonomy, for a few oligarchic groups to break away and benefit from the resources in their region. It is the state which has to plan the new design of autonomies of the country -- not the oligarchs. The oligarchs must be subject to the departmental governments, local governments, and indigenous peoples. It is impossible that they would design their own new autonomous country for the benefit of themselves. We don't believe in this. This is the new country that we want to offer, with social inclusion, overcoming marginality. And we are not going to do this by decree, without an opposition. The opposition has to be constructive. It has to incorporate itself into this project so that, together, we can move forward. Bolivia has 10 million inhabitants, and of these 10 million 4.5 million are indigenous. . . . This is not simply a project for the indigenous peoples, but rather for everyone. This is the platform that we are offering. JRW: The last question has to do with the international realm, and the impact of imperialism on the Bolivian process. We can see, with the coup in Honduras for example, that Barack Obama represents a continuation of American imperialism in the Western hemisphere. And with the Canadian state, as well, there is an imperialist vision vis-á-vis the Canadian state and Canadian capital and their operations in Latin America and the Caribbean. We can see this in the promotion of Canadian mining, the promotion of Canadian capital more generally in Latin America, the signing of free trade agreements between Canada and Colombia, Peru, and Mexico, all of which today have governments on the extreme Right. My question in this context is, therefore, what is your position, and what is the position of the Bolivian government, in the face of this imperialism, not only of the United States, but also of Canada? ETM: This question is in some ways quite simple, and in other ways complex. We believe we have President Obama, and then we have the Pentagon. These are two very different things. Similar to Evo Morales, Obama represents the most marginalized sectors of the United States, African Americans. We still believe in him, and his capacity to change everything that is the political nomenclature of the United States. This is a personal opinion. In the Canadian theme, and I believe it's a very simple theme, there is respect, bilateralism. There is cooperation with Canada. There is world view of a policy of mutual agreement and respect. And within this framework, we believe we can advance. They [Canada and the US] are countries of the G8, very developed. We have a country which is underdeveloped, but with dignity. We believe in the paradigm of the self-determination of peoples. This means respect. We are speaking in a symbolic way. But we believe, we are convinced, that we can go forward with our process of change within the framework of mutual respect. In this new conjuncture, there are consultations at the highest level between the Bolivian and American governments to resume bilateral relations.4 But within the framework of mutual respect. This is our diplomacy between peoples at the global level. You have to respect it such as it is. We are, poor, but dignified. JRW: Many thanks for your time. ETM: No, thank you. We are in a very special conjuncture in Bolivia. Evo Morales, Álvaro García Linera, David Choquehuanca, are moving from the same perspective, with the same objectives, with the same paradigms. And this is fundamental to moving forward. We are not constructing a country only for 6 million, but for all 10 million. We believe that in this moment we are defeating all those who suggested that Morales would govern for no longer than six months. We are demonstrating that when the moral and ethical commitment exists, it can succeed. This is a project not only of a few, but of a whole country, which is putting forth a process of change and major transformations. It's a participatory and democratic revolution, and, fundamentally, about social inclusion. 1 This is in reference to the foco theory of guerrilla struggle theorized by Ernesto Che Guevara and others based on their experience in the Cuban revolution. 2 This is in reference to a recall referendum held in August 2008 in which both Evo Morales and Vice-President Álvaro García Linera stood either to lose their jobs or re-establish their popular mandate. 3 These are different forms of cash transfers. Renta Dignidad, initiated in 2008, provides roughly $US 258 per month to elderly residents living in poverty. Bono Juancito Pinto, initiated in 2006, provides roughly US$29 annually to young children in order to encourage completion through the sixth grade. Bono Juana Azurduy, initiated in 2009, provides funds for uninsured mothers to encourage them to seek medical assistance during and after pregnancy. See Mark Weisbrot, Rebecca Ray, and Jake Johnson, Bolivia: The Economy During the Morales Administration, Washington, DC: Center for Economic and Policy Research, December 2009. 4 Bolivia expelled the US ambassador to Bolivia in September 2008. Jeffery R. Webber teaches political science at the University of Regina, Canada. He has three forthcoming books: Red October: Left-Indigenous Struggles in Modern Bolivia; Rebellion to Reform in Bolivia: Indigenous Liberation, Class Struggle, and the Politics of Evo Morales; and an edited collection on the Latin American Left with Barry Carr.